Faysselle is situated in rural South West France. The airports of Bergerac, Toulouse and Bordeaux provide easy access to the region. 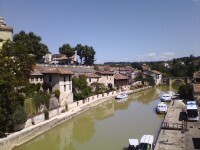 Agen, the capital of the deparment of the Lot-et-Garonne, is only a thirty minute drive away. In order to explore and appreciate this wonderful area of France, a car is essential. Excellent local shop with fresh bread, cheese, meat, fruit & veg and local wines. Café, monastic ruins plus a summer night market. Bakery, pharmacy. hotel including a 2* Michelin restaurant, and a summer night market. Bakery, pharmacy, hotel with restaurant for Plat du Jour lunches, and a summer night market. Nearest supermarket, open all day from 9am - 7.45pm, closed Sundays. Includes a petrol station. Numerous large supermarkets, wide selection of restaurants with a wonderful historical centre. Change at Lille or Paris. Click the following link for further information and top tips for Driving in France.​ If you plan to drive in France, or throughout the continent, we recommend European Breakdown Cover and Headlamp Converters. Begerac Airport is a convenient destination from many UK airports, such as Birmingham, Edinburgh, London Stansted, London City, Exeter, Manchester and Liverpool, among many others. Click here for more details.